I write a lot about ways to stop living paycheck to paycheck, and how to gradually increase your wealth. I spend a lot of time writing about ways to dig yourself out of a financial ditch, but I don’t spend as much time talking to people who have already gotten their finances on the right track. This is a great moment in your financial life. It’s like trying to get a kite to fly, when all of a sudden you feel a tug and the wind starts doing the work for you. In your financial life, this will be the moment you have more than enough money to cover your bills, less anxiety over financial matters, and no debt to speak of. But these aren’t the only benefits of a sound financial state. There are also professional relationships that you can cultivate which will save you all kinds of stress and money in the long run. Here are three that I find to be indispensable, but which many people I know (even those who have more money than me) don’t have in their phone contacts. There’s no excuse for that. Here are the three people I am glad to say are on my side in an emergency. My Doctor/Dentist. I spent about a decade of my life without going to the doctor or dentist almost at all. When I finally got my finances on track and had the money to cover my co-pays, I had several painful trips to the dentist to correct the problems that had cropped up in the interim. Never again. I have since made it to every scheduled appointment, but it took me longer to find a doctor I liked. I eventually picked out someone I knew socially, a friend with whom I had a good rapport. I could trust this person to listen and care about my health, after a series of doctors who seemed too busy or distracted to give me the attention I wanted. Don’t be afraid to shop around for doctors. If you have a health problem you will feel much better about the care you receive from someone you trust, compared to a doctor you just happen to visit. My Lawyer. Up to this point, my lawyer has only had to help me with one traffic violation. But even in that instance, I was so happy to have his number in my phone. Think of all the legal difficulties that could surface in your life: involvement in class action suits like PPI, workplace injuries, medical malpractice. You want a trusted friend in your corner if something like this happens. My Accountant. As a self-employed person, having an accountant is essential. My income comes from many sources, and it’s much easier for me to do my taxes and other complicated money documentation using an accountant. I found a reasonably priced CPA whom I love, and I’ll never go back to doing this stuff myself. 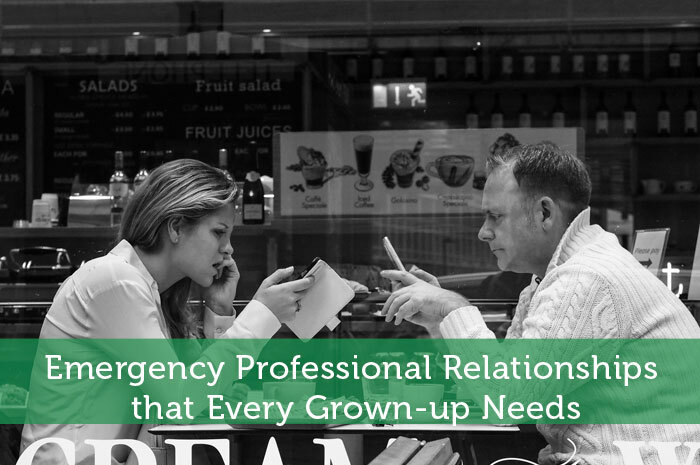 There are other professional relationships which can help you get out of a bind, but these are an essential lineup to have worked out well before you ever need them. Assuming you own a car and a home, a good trustworthy mechanic and a plumber are must haves. Medical and legal emergencies are more dangerous, but unreliable transport or no running water (worse, a flooded floor from a broken water heater) are chronic conditions which can have a surprisingly negative impact on your life and your finances. I too am just now getting to the point of being able to afford regularly going to the doctor. It’s very comforting to actually go in for check-ups and looking forward to hearing the news rather than going in when there’s already a problem and dreading what the costs/procedure will be. It’s nice to be able to stay on top of health! It tooke me about 5 years of being an adult to find a good family doctor, but well worth it! Other professional relationships I have found to be extremely valuable are a mechanic and a tree trimmer. There were multiple times with my first home that having a good plumber contact would have come in handy, but that’s how I learned to do a lot of basic plumbing myself. Many people look at these relationships as ways to get great deals, but at least for me the real benefit is having the work done by someone you can trust who is also willing to show you how to do the work. As much as a family doctor and lawyer are a must haves on any self-employed couple’s list, I find it also important to have a driver and a cook, these two will ensure that if you have kids they get home on time and find food on the table and save you the hustle of having to rush that important meeting. Anybody in the professional world definitely needs a good tailor. Homeowners should have a solid general handyman. If your a carnivore, it’s always nice to have a local butcher.